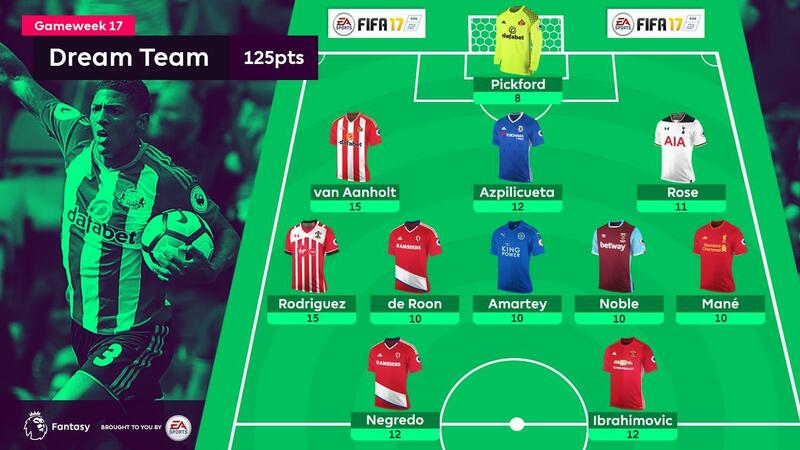 The Fantasy Premier League Gameweek 17 Dream Team is built around a triple threat of midfield ball-winners who all chipped in with crucial goals. Attacking full-backs, a potential differential in the Southampton ranks and a pair of revitalised forwards help complete a 3-5-2 line-up. The budget stopper earns a second call-up to the Dream Team upon gathering his second Sunderland clean sheet of the season in the 1-0 win over Watford. Another benefactor of the Black Cats' shutout, the Dutch left-back added to his tally with the winning goal - a third strike of the season. Van Aanholt has claimed Dream Team recognition with each of those goals, earning more call-ups than any other defender. The top-ranked FPL defender extended his lead with a season-high haul in Chelsea's 1-0 win at Crystal Palace, earning a belated Dream Team debut. The Spaniard has now gathered bonus points in his last three outings and in nine of 17 Gameweek appearances. A second call-up for the Spurs left-back, who raided forward to blast the Spurs winner against Burnley on Sunday. He joins an elite club of five defenders sitting on three goals and, together with Van Aanholt and Chelsea's Marcos Alonso (£6.4m), sits top for attempts among FPL defenders with 18 efforts. A brace of goals in just his third start in Sunday's win at AFC Bournemouth earn the Saints’ striker a Dream Team debut. Classified as an FPL midfielder, Rodriguez could present an effective differential should he cement a starting role in Claude Puel's line-up. Hardly renowned for his scoring touch, the combative Dutchman earns a Dream Team berth courtesy of a second strike of the season in the 3-0 win over Swansea City. The Ghanaian also makes his debut following a late Leicester City equaliser at Stoke City. Like De Roon, he offers a cheap option as a fifth midfielder to occupy the FPL bench. 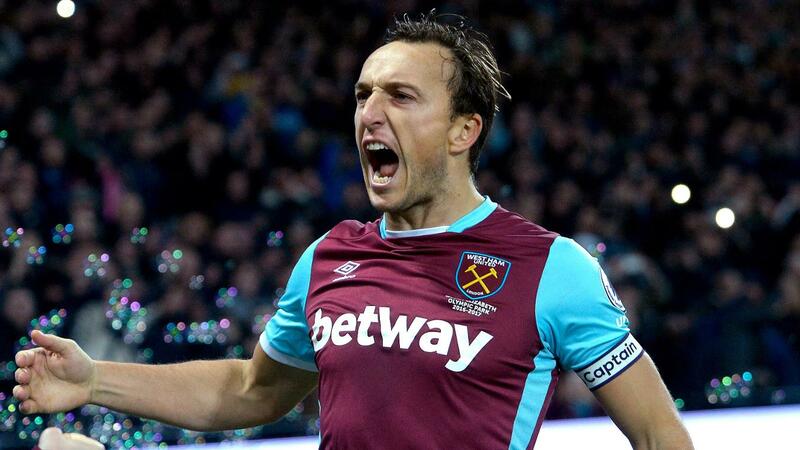 Without attacking returns until Gameweek 16, the Hammers skipper recorded back-to-back goals with a converted spot-kick winner over Hull City, earning his first bonus points of the campaign. The Senegalese continued his impressive form by providing the winner at Goodison Park on Monday night: with two goals and three assists, he has now returned in four of the last five Gameweeks. An expected departure for the Africa Cup of Nations in January provides a major caveat, though Mane remains an attractive investment ahead of Liverpool's next three fixtures. The Spaniard’s renaissance as an FPL asset continued as he took his tally to four goals in as many Gameweeks with a brace at home to Swansea City. Negredo’s ownership is back on the rise ahead of a favourable early schedule for Middlesbrough in 2017. With seven goals in his last six Gameweek starts, Ibrahimovic has timed a stunning return to form to coincide with suspensions for Manchester City's Sergio Aguero (£12.8m) and Chelsea's Diego Costa (£10.9m), plus Harry Kane's (£11.3m) back-to-back blanks for Tottenham Hotspur. More than 246,000 FPL managers have now acquired the Swede's services ahead of Gameweek 18.